It’s always a challenge every year to find holiday gifts for friends and family. Trends are always changing and there are so many great things to choose from. If you want to find something that stands out, consider buying from a small business, local artist or creator. A lot of these folks (artists and myself included) put a lot of hard work and love into what they do to ensure they can make people happy. Small businesses also offer a lot of unique items you can’t just buy from the mall, making these gifts one-of-a kind and extra special. 1. SHIRTS! You can never have enough shirts, whether they be tees, sweatshirts (and tanks too). If you like fandom references, The Colorful Geek has a lot of shirts to choose from for men, women and kids. 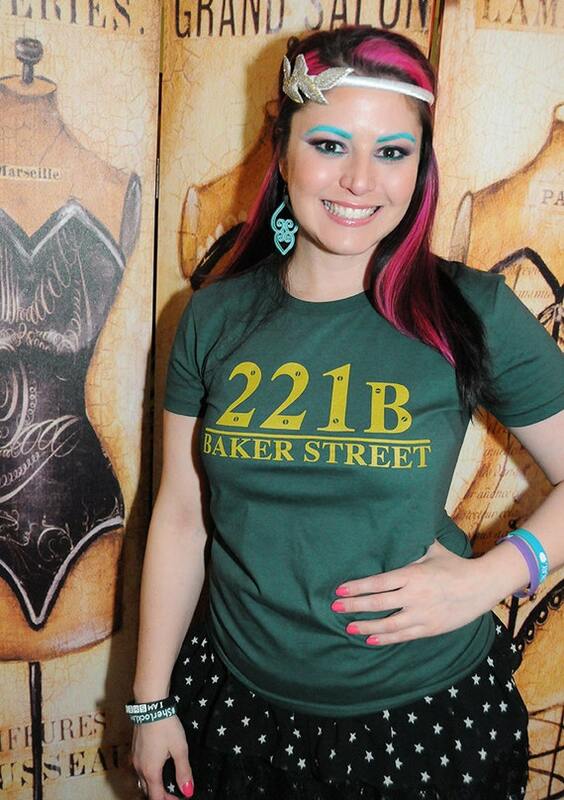 I’m especially fond of this 221B tee (but she also has shirts for Potterheads, Whovians and others!). If you’re going for something more subtle and love typography, consider awesome sweatshirts by Jordandene. These are super cozy and comfortable to wear, and I’ve gotten away wearing these to work (but maybe that’s because I work for a font company). You can geek out without overdoing it. 2. FANDOM TEAS! Adagio fandom blends is AWESOME if you’re looking for unique loose leaf teas. You can get these in different sizes, which is great for those who love tea or folks who are new to it. Samplers are great ways to try different flavours and are easy to wrap up as gifts. You can also buy tins individually (each hold about 0.5 oz. of tea). Or you can get 3 oz. bags or 5 oz. tins. Cara McGee‘s Sherlock teas and Aun-Juli Riddle‘s Tales of Tea Leaves (Lord of the Rings) teas are pretty much awesome. My personal favorite out of my own tea blend collection: Freakin’ Apple Pie. It’s for anytime and anywhere. 3. GEEKY CANDLES! Candles are great for book lovers, or if you want to make a room smell good. I love Frostbeard candles since their scents are wonderful but not too smelly or overpowering. They also release limited scents every month. This Christmas in the Great Hall makes we want to go to Hogwarts for the hols. Tarts are also available for those who have a tart warmer. 4. MAKEUP FOR NERDS! Shiro Cosmetics is my new favorite place to get makeup because not only is it all handmade, but there are a lot of products based on fandoms like Game of Thrones, Pokemon and more. There are sooo many shades of eyeshadows, as well as fun lip glosses, lip tints and face powders. I usually don’t get too crazy with eyeshadows, but I love the Hobbit collection. For lips, the Mizaki Lip Balm Tints are absolutely awesome for people who don’t like to wear lipstick. The colors are gorgeous! 5. FANDOM BUTTONS (also keychains and jewelry)! Because I love quotes and typography, Pepper’s Pins is a great place to get stocking stuffers for your fellow nerds. You can get individual buttons, sets, and even ask for keychains, magnetic charm bracelets and necklaces. 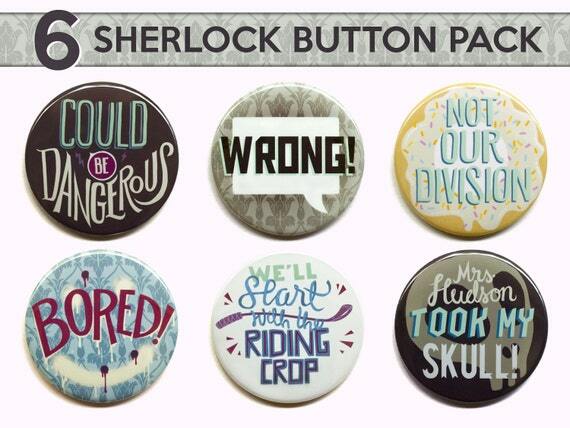 I love this Sherlock button set. 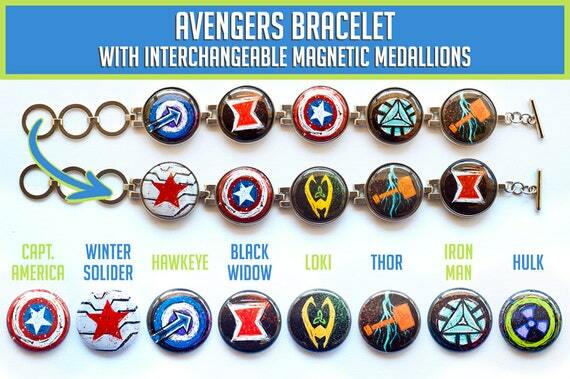 And this Avengers interchangeable charm bracelet is pretty cool. You can change your bracelet with a new charm everyday! 6. CHARACTER PILLOWS! Heart Felt Design makes the cutest character pillows from all different fandoms! Each one is made-to-order out of fleece and are wicked great gifts for anyone! She also takes custom orders too. 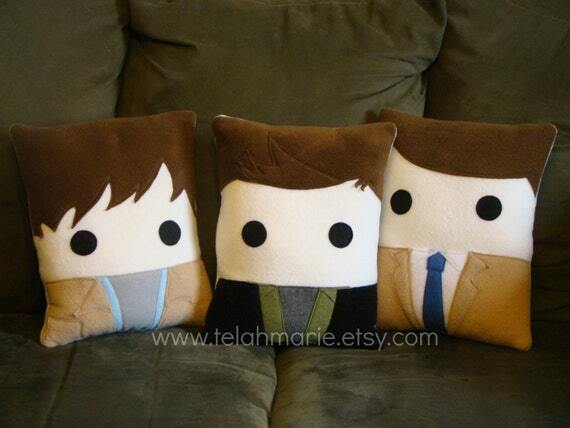 I have to admit, I’d love to have these Supernatural pillows in my living room. 7. GEEKY HAND TOWELS! You can’t go wrong with a fandomy hand towel for your bathroom or kitchen. Whether you like Adventure Time, Star Trek, or video games, Seams Geeky has it all. Designs are made-to-order one at a time. 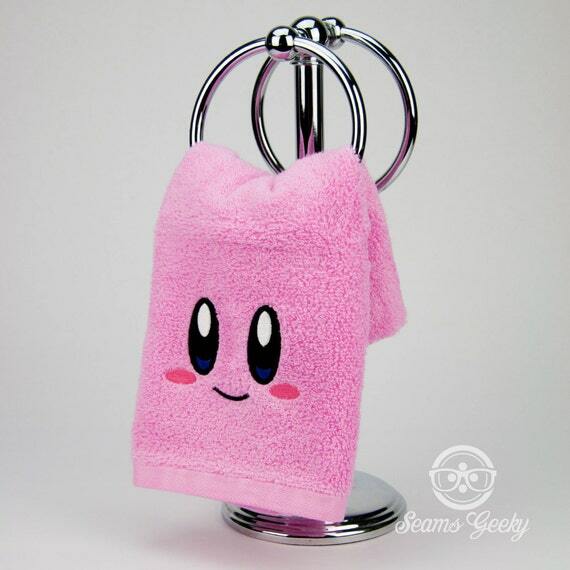 I really love this Kirby towel…I swear this is something he would do if he flattened himself. That wraps up this gift guide for now. The next edition is going to cover gifts for the ultimate Harry Potter fan! Stay tuned for more!